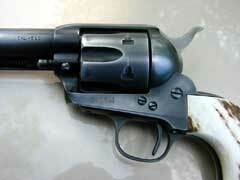 Home antiquing transformed a budget-priced Uberti sixgun into one of the author's favorites. 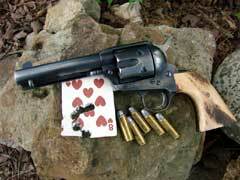 Boge's Uberti "Gunfighter" model, as he received it (photos courtesy Sack Peterson). Author derived a bit of perverse pleasure from purposefully marring the screw heads with improper screwdrivers in order to enhance the vintage look. 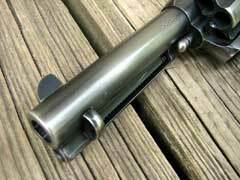 All of us who appreciate the guns of the Old West - from Colt-style single-action revolvers; to Smith & Wesson-style Schofield revolvers, as well as other top-break designs; to old-style shotguns; to lever-action, slide-action and single-shot rifles, to name but a few - owe a debt of gratitude to the game of Cowboy Action Shooting. 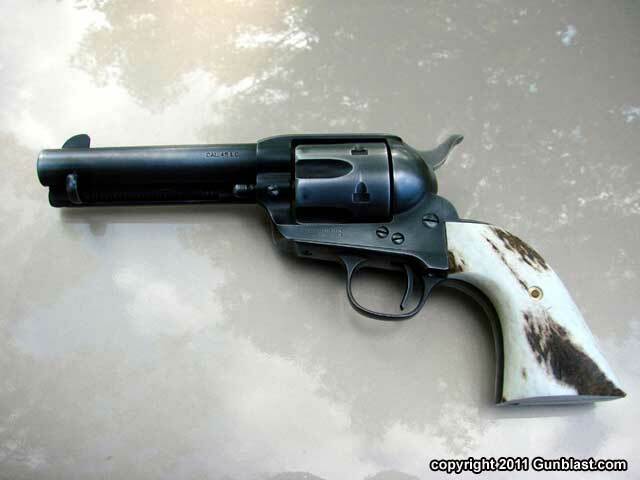 The popularity of Cowboy Action Shooting (CAS) has encouraged manufacturers worldwide to offer a great variety of reproductions of some of the finest weapons ever made. I don't shoot CAS myself, but those great old weapons are the ones that truly stir my soul, as they stir the souls of many who nevertheless choose not to participate in the CAS game. I am grateful to the CAS folks for helping to create a viable market for these weapons, which are "obsolete" to some, yet in my opinion remain unsurpassed in many ways to this day. 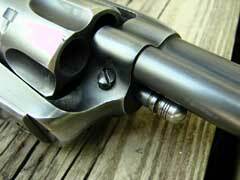 As I stated above, I am not a CAS shooter. As should be obvious, I have nothing against the game; I just don't have the time and money to devote to another hobby. Collecting firearms, stringed musical instruments, and vintage pocket watches keeps me broke most of the time, and playing music (as well as my current shooting activities) tends to take up any leisure time I might have. 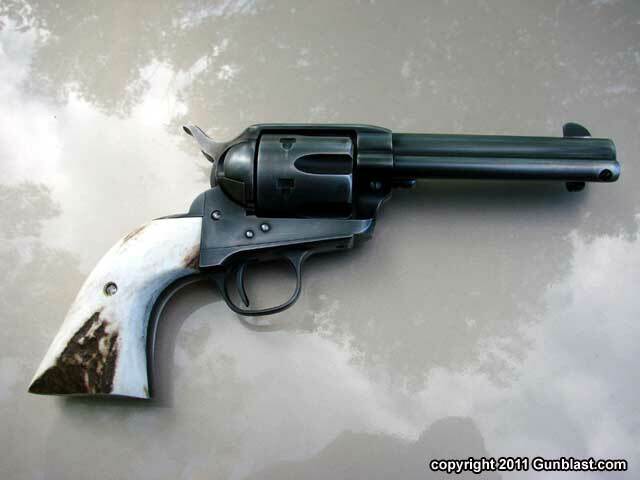 Also, the powder-puff loads that the CAS game gravitates toward tends to make the game less realistic to me, but that's just one man's view; I am thankful that so many do participate in CAS, as it allows me to feed the gun-collecting beast within me. 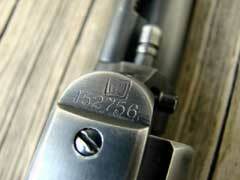 Not only has the advent of CAS been instrumental in seeing so many original designs brought back, but CAS has also played a large part in creating a market for accessories such as authentically-styled gun leather and clothing, which are required to participate in some categories of CAS. CAS is a game in which a well-heeled shooter can spend any amount of money for a full rig, including everything from weapons, leather, and clothing (even authentically-styled underwear! ), and any number of accoutrements. I know many CAS shooters who are fanatical about the authenticity of their rigs, spend large amounts of money on them, and have the time of their lives sharing their passion with other like-minded shooters. CAS is also a game which welcomes the novice shooter and those whose budgets are more limited, and there are a good number of weapons available to suit those who are just getting started in CAS, or whose budgets won't allow them to go "all-in" on a CAS rig. 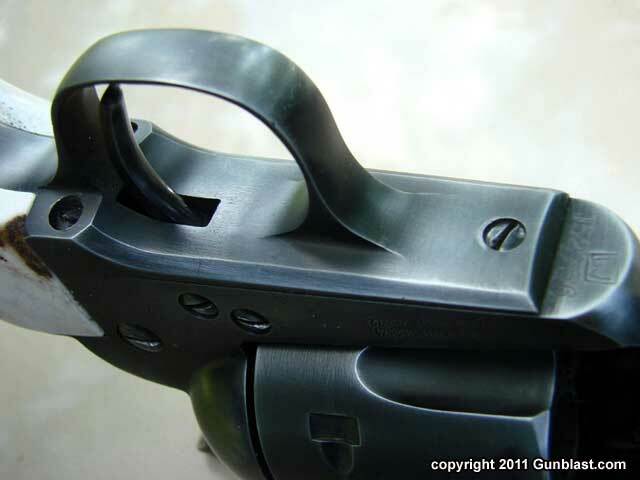 These weapons generally exhibit a level of quality comparable to the more expensive models in a given manufacturer's catalog, but with a less-refined finish. Rather than the lustrous blue and beautiful case-hardening (or bright nickel) finishes found on the "nicer" models, these "bargain" models typically have more subdued matte finishes, but are in most ways the equals of their typically-more-expensive brethren. 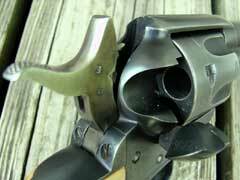 Many makers offer weapons, especially Colt-style revolvers, of this type, and one of these is the subject of this article: the Uberti 1873 Cattleman "Gunfighter". 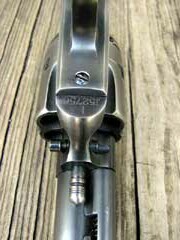 When my Uberti was made in 2004, the "Gunfighter" moniker indicated a matte-blue revolver, and the matte-finish option is currently offered by Uberti as the "Chisholm" (with steel grip frame) and the "Hombre" (with brass grip frame). 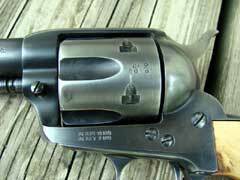 The Chisholm model is more expensive than the Hombre, and is in fact a bit more expensive than the standard Cattleman with blued and case-hardened finish in the current catalog. 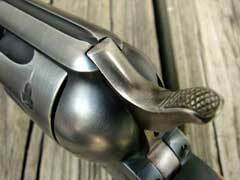 My Gunfighter bears the Stoeger, Accokeek, MD importer mark. 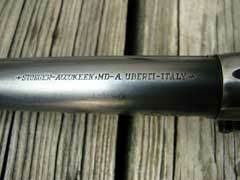 Uberti is a well-known Italian maker, and is now owned by Beretta. I will admit that I've never found these matte-finish sixguns particularly attractive, as they just don't look "right" to me. 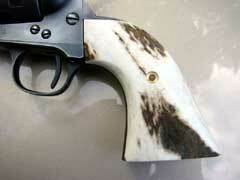 I probably would not have been tempted to buy this one had it not been for two things: first, it wore a set of beautiful American elk stag grips by one of my favorite makers, Sack Peterson; and secondly, it was made available to me by Mr. Peterson himself, who had used this sixgun as a "test mule" for developing a pattern for the Uberti sixguns, and he sold me this sixgun, complete with the grips, for little more than the grips alone would have cost me. I can't resist a bargain on a sixgun, especially if it comes with such lovely grips, so I bought the gun, admired the beauty and fit of the grips, shot it enough to determine that it would shoot, then lost interest and put it in the safe. 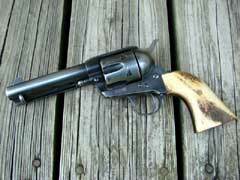 After a while, I started thinking about what I could do with that Uberti, and I decided that it might be a fun project to "antique" it myself. 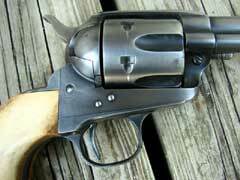 The idea of antiquing a modern "clone" sixgun is nothing new; folks have been doing it for years, and several makers are now offering the finish as an option on their sixguns (Uberti catalogs it as the "Old West" model, and it is a nice-looking antique finish). 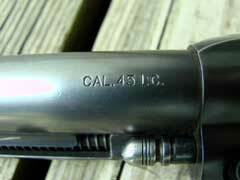 I also own a limited-edition 45 Colt USFA Rodeo Sheriff's Model which features a prototype of what USFA now calls their "Antique Patina" finish. This finish is offered on their "Gunslinger" model; marked on the box of my Rodeo Sheriff as a "custom" finish, my Sheriff's Model may be the only one of those Rodeo revolvers so finished, and it is beautifully done. 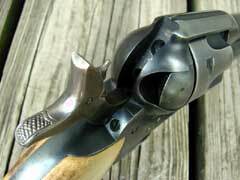 So, inspired by that factory-custom Rodeo, I decided to go ahead with my "Antique Uberti" project, reasoning that (to quote my friend Hamilton Bowen) "The worst I can do is ruin it". 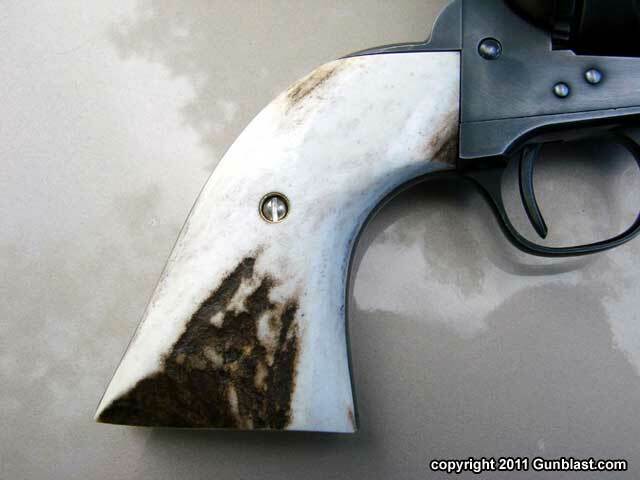 I did some research on the methods folks were using to antique their finishes, and they mostly involved disassembling the gun and using some chemical or mechanical method to remove the finish, then reassembling the gun basically unfinished. I was less than impressed by the look of most of these projects, as the end result appeared pretty much to simply be an unfinished gun, not one whose finish had been worn away by decades of use. 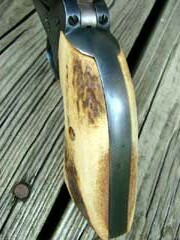 The methods used for these finish projects also sounded like way more trouble that they were worth; I am a pretty lazy guy by nature, and it seemed to me that a more acceptable result could be obtained without so darn much work. 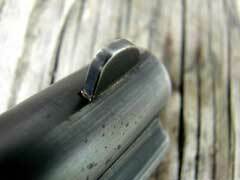 The method upon which I settled wasn't nearly as involved or as scientific as some, but I was pleased with the result. I did not disassemble the sixgun, as I reasoned that "real" aging processes occur when the sixgun is in one piece; I did, however, remove the grip panels, mostly because I didn't want to mess up the pretty elk stag grips. I sat down with the sixgun, a couple of gray Scotch-Brite pads, a good cigar, and popped "The Great Escape" into the DVD player. I then commenced to rub the sixgun with the Scotch-Brite pads, mostly in long strokes and cupping the pads in the palm of my hand so as to spread the wear in a natural pattern. 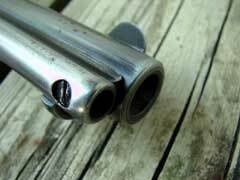 I tried to concentrate my rubbing over areas that would naturally see more wear, such as the muzzle end of the barrel, the end of the ejector rod housing and the ejector rod button, the leading edge of the cylinder, the backstrap, the large frame flats, the top of the frame, etc. 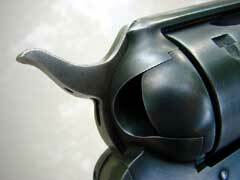 Rubbing over large areas left bluing in recessed areas, adding to the realistic effect. I did remove the cylinder long enough to apply a bit of rubbing inside the cylinder frame, to make sure my wear pattern was even over the cylinder, and to evenly wear the base pin head. I proceeded in a leisurely fashion, taking breaks to observe my progress (and to take puffs on that nice Dominican cigar), but the process went surprisingly quickly. By the time the movie ended, I was done. Total time: about three hours. As a finishing touch, I applied some torque to the screws using improperly-sized screwdrivers so as to intentionally "bugger" the screw heads a bit. 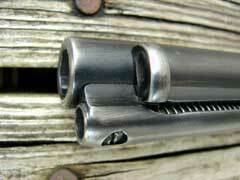 I figured most 19th-century sixgunners didn't have Brownells screwdriver sets, so some screw-buggery was to be expected. It was a subtle bit of authenticity that also proved to be satisfying on a psychological level, as I've always been compulsive about not messing up screw heads with improper tools, and it was nice to be able to "let go" for a change. 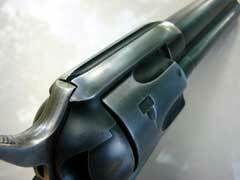 As I write this, it has been about six months since I completed the "Antique Uberti" project. To say I was pleased with the results would be an understatement; due in large part to the antiquing project, this Uberti has become one of my favorite sixguns. 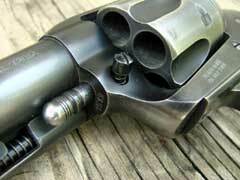 I have handled it a lot, and I have shot it a lot. 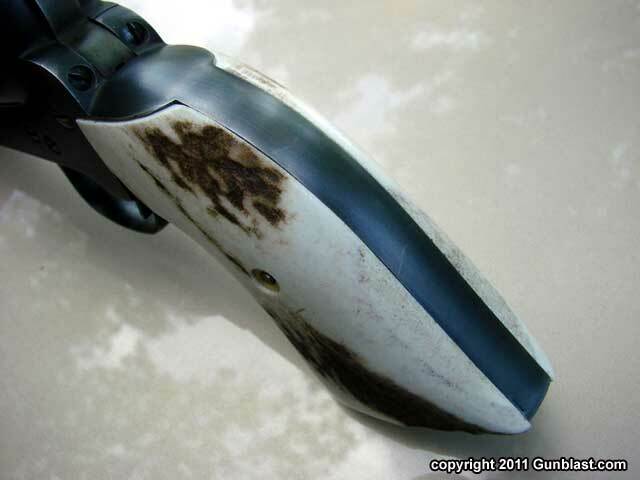 During the intervening months, the sixgun has continued to improve in appearance, with some of the larger scratches (where I initially was a bit too energetic with my rubbing) evening out, and a few dark spots developing in just the right places through honest use. 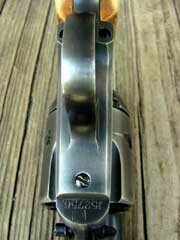 The action has smoothed to a fare-the-well, and a replacement Heinie bolt spring from Brownells was a simple and inexpensive improvement to the sixgun's trigger pull and reliability. 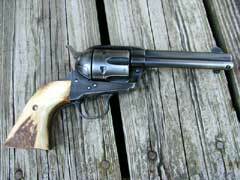 When my brother Jeff had a look at my Uberti a couple of weeks ago, he did offer one bit of what turned out to be very constructive criticism: he really liked the look of the sixgun, and thought I'd done a great job of replicating the mystique of the old Colt sixguns, but he offered the opinion that the grips just didn't look right. Those bright, new elk stags just didn't look at home on that antique finish, and he suggested that they would look great stained with tea or coffee. I had been loath to do anything to those grips, as I thought they were beautiful as they were and I had never tried dyeing a set of grips before; but as I considered the possibilities and remembered that Jeff had never steered me wrong over the course of my life, I decided to give it a try. I had my new bride brew me up a strong batch of tea (six standard-size tea bags in about eight ounces of water, just enough to completely cover the grips in a margarine container) and I began to soak the grips while periodically checking on their progress. After about two days I had the shade I wanted, so I removed the grips from the tea and let them dry on a sunny window sill for three full days. 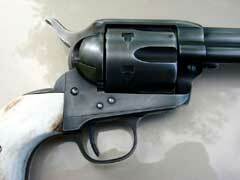 After hand-rubbing them with a soft cloth, they were ready to reinstall on my Uberti. I am extremely pleased with the result; the shade is just what I wanted, and the hue is very close to Sambar stag. Jeff was right again, and this Uberti is a sixgun I have a tough time putting down. 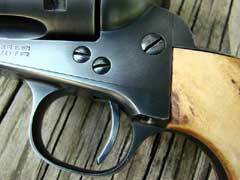 Have a look at Uberti's extensive line of Old-West style guns at www.uberti.com. 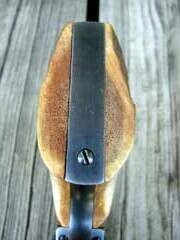 For some of the finest American elk stag grips available at reasonable prices, visit www.sackpeterson.com. Boge was very pleased with the result of his initial antiquing. 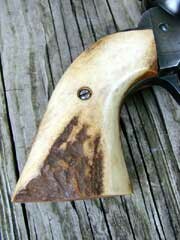 Sack Peterson American elk stag grips were beautiful as issued, but a bit too pristine in appearance once the finish antiquing was complete. 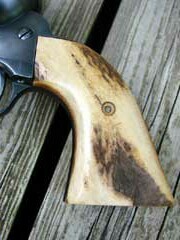 Tea-dyeing made the grips look more in-keeping with the "antique Uberti" appearance, and much more like old Sambar stag. 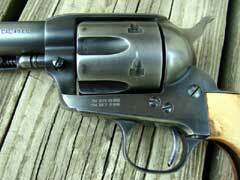 As this 1-3/8" five-shot group shows, this Uberti sixgun can shoot as well as it looks. 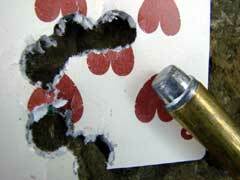 Group was fired two-handed, standing at a range of ten yards, using Boge's favorite mid-level handload. 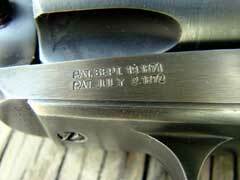 "BU" date code indicates this sixgun was made in 2004. Cylinder bears Italian proof marks.